A great deal of attention has been placed upon the numbers of migrants arriving in Europe with far less concern paid to how those migrants might be supported to integrate into European societies. Researchers at Birmingham have undertaken studies looking at what works in migrant integration and identifying good practice in migrant integration. They have also analysed large datasets examining refugee integration outcomes enabling them to assess what kinds of experiences are ant-integrative. 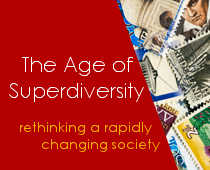 Jenny Phillimore explains for the Birmingham Heroes series what superdiversity is and how it affects our daily lives. They find that migrants and refugees fare better if they have access to good quality language training and education, volunteering opportunities, mentoring and initiatives for women. Migrants repeatedly express the desire to contribute and be accepted. Analysis shows that those who experience racist harassment are less likely to be employed or to report good health, than those who do not. Further initiatives that support the general population to welcome migrants are generally highly effective in supporting integration. Researchers’ work has fed into the re-assessments of the EU’s Common Basic Principles for Integration and into various UK Government reviews. Most recently the IRiS team have used their expertise around migrant integration to train individuals working with refugees and unaccompanied asylum seeking children. They have created a refugee integration toolkit that can help local areas support the integration of Syrian refugees.